So, all this happened during the time that Herod was ruler of Judea because of Roman allowance. There was a priest named Zechariah who had a wife named Elizabeth (who had priestly ancestors--even Aaron!). These two were righteous before God and followed God's commands. Everything seemed wonderful except they had no children because Elizabeth was barren. What made it worse, though, was that they were getting older and running out of time to conceive. One day, Zechariah was called to do his duty and be the individual who carried the incense into the Holy of Holies in the Temple. While everybody waited on Zechariah to return from the place where they believed God rested, Zechariah was having an intense conversation with an angel. The angel informed Zechariah that he shouldn't worry about having a child because God had decided to fulfill part of God's plan by giving Zechariah and Elizabeth a baby--a very special son who would be called and appointed to ministry before his birth. He would be the one who prepared people for the coming of the Messiah. The angel insisted that he should be named John. Zechariah struggled to believe it and asked the angel for some proof. The angel identified itself as Gabriel and said it had been sent to share good news but if Zechariah wouldn't trust it, then he'd get his proof.Zechariah lost the ability to speak and when he finally left he had to motion and gesture to make people understand. He returned home a few days later and each day he was confronted by his muteness and consequently the reality of what had happened to him when he encountered God.Elizabeth conceived like they had been told. She rejoiced at her pregnancy. Six months later, Gabriel was sent to a little town of no consequence called Nazareth. There, he met with a virgin named Mary who was engaged to a man named Joseph. He greeted her with joy and said, "Greetings, Mary. You are favored by God to do God's will and even now God is with you." She didn't know how to respond and wondered what Gabriel meant by "...favored by God to do God's will..." Gabriel saw her confusion and continued, "Don't worry, Mary, for you have pleased God with your faith. You will conceive a son and you should name him Jesus. He'll be like nobody before him or after him. He will sit in king David's throne buthiskingdom will have no end." Mary finally squeaked out a question: "How can this be, since I am a virgin?" Gabriel responded, without a moments' hesitation--as if he knew she would ask it--by saying, "God will overshadow you and the child will be set apart--special for God's purpose. The boy will be called the Son of God for he will truly be the Son of God." As Mary marveled at this thought, Gabriel continued, "Your relative Elizabeth whom you thought was barren has also conceived a son--a very special one--by God's will. That child's father is Zechariah, though, and not God. So Elizabeth who once was barren will give birth in her advanced age because nothing is an obstacle to God's will. Then Mary confessed her faith by saying those sweet words: "Here am I, the servant of the Lord; let it be with me according to your word." At that, Gabriel departed from her. After all this happened, Mary decided to go and visit Elizabeth. Maybe she was going to confirm what she had been told and now believed. Regardless, when she arrived she entered the home of Zechariah and Elizabeth with a friendly greeting toward Elizabeth. 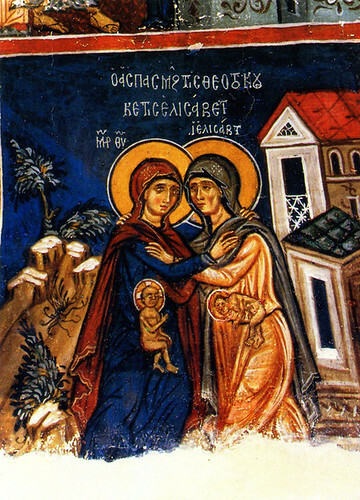 At the sound of Mary's voice, Elizabeth and Zechariah's baby jumped in Elizabeth's womb. In the voice of Mary, John could already hear the sound of salvation and redemption at work. Elizabeth was shocked at the reality of what was going on and was moved by the Holy Spirit to proclaim, "You are blessed among all women, Mary! Your son is most surely blessed, too! What have I done to deserve this great honor--for the mother of my God to come into my home. Mary, as soon as I heard your voice the son I now carry jolted within me because of its joy to be near your child. Mary, you are truly blessed for your faith and trust that God will do for you what God has decided." Mary stayed with Elizabeth for three months before returning home. Elizabeth gave birth to her son and they named him John--the one who would be known as "The Baptizer"--at Zechariah's insistence and Zechariah regained his ability to speak. His first words were praise to God who had worked such a wonder in his life and in the lives of those dear to him.